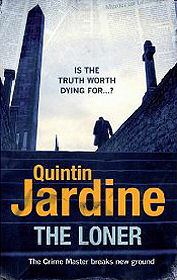 Quintin Jardine will be known to his many fans for two series of novels. In one, tough Edinburgh cop Bob Skinner has worked his way up to become Chief Constable of Lothian and Borders Police, while in the other, readers have followed the adventures of Oz Blackstone, movie actor and one time "private inquiry agent". Jardine has been ringing the changes in both series of late. The most recent Bob Skinner novel, Grievous Angel, takes its central character back in time to an earlier point in his career, with great success: while Oz Blackstone has been supplanted as protagonist in Jardine's second series by his ex-wife, Primavera Blackstone, again successfully. "The Loner" takes a very different approach. It is a free-standing novel telling the story of Xavier Aislado as he grows up in Scotland and goes on to pursue a career in journalism after dabbling in professional football. Xavi has it all: a caring and wealthy Scottish/Spanish family, a beautiful girlfriend, lifelong friends, an increasingly successful career. What could possibly go wrong? A great deal, as it turns out: some of it flagged up in advance by the author, some if it arriving with as much surprise for the reader as for Xavi himself. The title chosen by Jardine for the book operates as a pun at two different levels. The book is presented as Xavi's biography, "as told to Quintin Jardine", and as a result Jardine himself appears in the opening "co-author's note". One pun is spelled out in the opening chapter: Xavier Aislado translates into English as "Xavi the Loner". At another level the title also aptly describes this freestanding novel's position, largely (but not totally) unrelated to Jardine's two ongoing series of novels. "The Loner" is very different in style and approach to anything we've seen from Jardine before. The plot develops over a period of many years rather than, as is more usual for him, days or weeks, and there is a sense in which this is a book primarily about characters rather than actions. As a result the pace is much more restrained than Jardine's readers will be used to: yet as the book builds towards its climax it becomes every bit as gripping as anything we've seen from the author before. Overall, we'd rate Quintin Jardine's new venture as a huge success and would heartily recommend it to anyone who has enjoyed his previous work: or, indeed, anyone simply looking for a satisfying novel largely based in Scotland.